2. Cut (2) 5-1/4″ x 4″ pieces of Whisper White Cardstock. Center and adhere one piece inside your card base and the other on top of your card. 3. 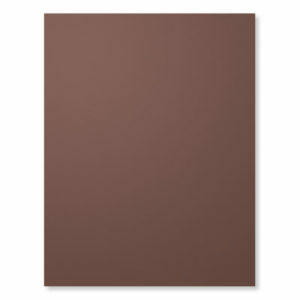 Cut a 5″ x 3-3/4″ piece of Marina Mist Cardstock. 4. 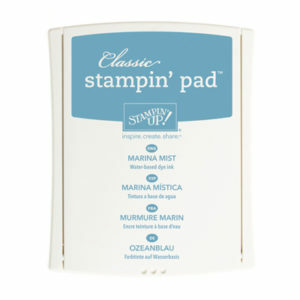 Use your Marina Mist Ink pad to stamp your cross randomly to create a patterned background. 5. Center and adhere your Marina Mist background to the top of your card base. 1. 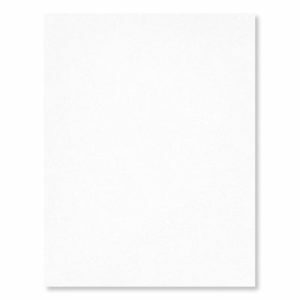 Cut a 2-1/2″ x 3-1/2″ piece of Whisper White Cardstock. 2. Use Marina Mist Ink to stamp your cross. 3. Use an Early Espresso Ink Pad to stamp your sentiment. 4. 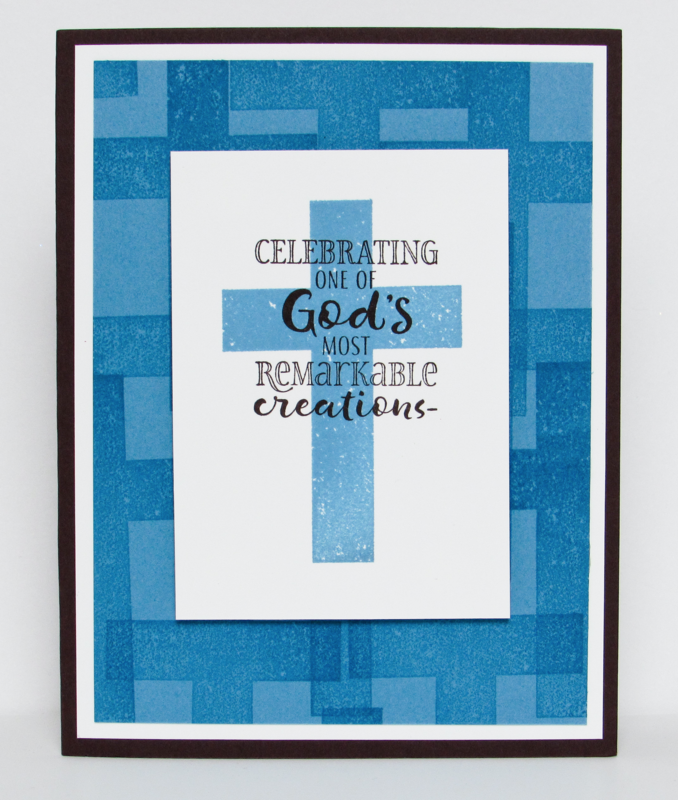 Use stampin dimensionals to adhere your image to the center of your card base. 5. Don’t forget to stamp “You!” inside your card. This one of the sets I had picked out before I knew you had created it and the story behind it. It is the first one of these I felt had the most versatility. Love your ideas. I received one of these cards from you, and I love it! Can’t wait to purchase it; you did a fantastic job! Brandy, You are such a treasure. We are so proud of you for designing this set and you gift box is so very beautiful. Thank you for this project and your inspiration. Beautiful card as always Brandy. The stamp set is just lovely, like you! I love this stamp set, it is so much needed in this day and age when so many people could use some hope. The cards are beautiful. Thank you so much for the opportunity to win this set I would really love to win. Thank you so much for sharing that awesome stamp set and dies. I love your videos and cards that you make and I have been following you for sometime. Brandy you make such beautiful cards and thanks so much for sharing this set with a video. I will definitely be ordering the stamps and dies. What beautiful cards!!! Congrats on being to design your very own stamp set!!! This is a must have for my collection! This is such a beautiful set – thankyou for your design and hardwork! This bundle is awesome! I have never seen the background made this way before. You have given me a lot of card ideas, and for that I thank you. I would love to win this set. As always Brandy, you nailed it! What a beautiful card, uncluttered and simple to make. It delivers a wow factor for the eyes and heart. Thank you for sharing. Brandy a lovely card and a very needed design if I am not the lucky winner I will defiantly buy it . God bless Parker so good to learn he is handling the treatment well. Hope you and yours have a blessed Christmas. I absolutely love your new stamp set and coordinating dies. Thank you for designing a religious themed set, and congratulations on your $1M sales achievement! Thanks, also, for your videos and easy to follow directions. They are greatly appreciated! Beautiful cards and lovely stamp set. Thank you for designing it around HOPE. Thank you for doing a giveaway too ? Blessings to you. Very nice – love the cover on the acetate box – and how wonderful for you on reaching your million dollars and designing thiis set! May the coming year be filled with family, friends and much love and joy! The cross you designed is really beautiful. Your card is so lovely. I wish you and your loved ones a very merry Christmas and a wonderful year for 2018. Love this set, Brandy! I can see getting a lot of use out of it for making cards for friends and shut-ins. What a beautiful and thoughtful stamp set! Love the card tutorials as well. Love the cards. You are always very inspiring. Thank you. A beautiful stamp set and as always, such a nice video and card that you made with it! Thanks for sharing and God bless you Brandy! Love that stamp set and the words. We all have people to send this type of card too. Absolutely beautiful!!! I love it and especially the story behind it !! Love this stamp set. Definitely one to put on the ‘keep always’ and ‘go back to often’ shelf. Your videos are always so wonderful. Thank you for sharing! Love your inspirational stamp set! It was very thoughtful of you to develop this set for all of us. Unfortunately nowadays we need a set like this. I am presently a cancer patient, and have been told by friends that it is so hard for them to find just the right card to send me. Now it’s here! Congratulations, you’ve designed a beautiful stamp set. Thank you ?? Very nice set of stamps. I don’t have very many stamps regarding hope; you did a great job with the design. Beautiful stamp set and framelits. Congrats on your design of the set! You are always such an inspiration to others and it doesn’t surprise me that you would design such a beautifully inspirational stamp set. I love watching your videos and tutorials and the love for what you do comes through every one. Bless you Brandy. The merriest of holidays to you and your sweet family. Love the Blue Cross Tutorial. I try to mail cards to members who are baptized at my church. 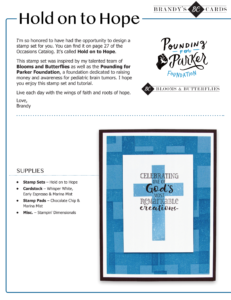 This blue cross Hold on to Hope Tutorial is perfect. Thank you. Brandy I love the stamp set. You did a very nice job at helping to create it. Have a Merry Christmas. Such a beautiful stamp set. I love the tought and creativity behind this card and would love to own it! I love this stamp and die set. What a nice way to share your faith and send some love. I always enjoy your videos, Brandy. Thank you for all of the work that goes into them. This is a beautiful set! Love it! Yes, it is a beautiful stamp set Brandy designed, which I will purchase when it becomes available. I live in Winnipeg, Manitoba Canada and watch Brand’s videos online. Thank you so much for sharing your video with me. I really LOVE, love, love your new stamp set that you have designed and those framelits… WOW! I already have so many Ideas I could create with it. Love what you did with the cross as a background. I love how creative you are and how you always inspire me. Brandy – I can’t wait to purchase this set and its thinlets also. I like to make cards for members of my Church and I can see a lot of possibilities for this set. I love the hold on to hope sentiment. Such a great set. You have done a fabuious job making it easy to use it for differesnt occasions. I love it! What a lovely set.not to mention thoughtful and loving! Hi Brandy I love this stamp set you really got it just right,The cards are beautiful I was not going to order anything any thing for a while but you got me with one. Brandy, I absolutely LOVE your new stamp set and ALL the beautiful cards you have made with it. What a great idea to use the cross for the background. Thanks for sharing! This is stamp set is so great. Our little Chloe has undergone 10 months of cancer treatment and is doing good. I think this will make excellent thank you cards to all the nurses and doctors that have helped her. Thank you for your love and support to childhood cancer. Your Hold on to Hope stamp and die set is gorgeous. The Hold on to Hope stamp and die set us gorgeous. Love your new stamp set! My friends 5 yr old granddaughter is battling leukemia and I would love to make her a card with this stamp set! Thxs for your kindness . Brandy these cards are absolutely gorgeous! The stamp set can be used for several different occasions. Looks like another set on my wish list. The flourish looks beautiful especially using the die. Thanks once again for sharing your talent. Beautiful cards. Love the stamp set and dies. Thank you for a chance to win them. Beautiful cards and I love the sentiments expressed by the cards. This stamp set has a special meaning to me as I have a beloved cousin struggeling with a recently diagnosed disease which could lead to blindness. She IS holding onto HOPE as she, and the rest of the family are holding onto the HOPE Giver. I’ve learned so much from you and continue to press in to learn even more. At age 80 I’m having to be a fast learner!! Can I say I’m proud of you for creating this beautiful stamp set ~ it’s so much more than just stamping! Congratulations!!!! I love this stamp set… cannot wait to get my hands on it! You are such a sweet and wonderful person to do all of this for Parker! May God bless you, your family and Parker’s family! Thank you, Brandy! You make stamping look super simple, I am just getting started and trying to get my two granddaughters excited about it to. I was surprised that cross background paper was stamped, and not DSP! I was NOT surprised that you were chosen to design a stamp set, however. I love your enthusiasm and positive spirit, and the way you have supported Parker. Surely you will have many crowns in Heaven, Brandy! I can hardly wait for the catalog to come out. Beautiful stamp set. There seems to be so many ways this set can be used. I cant wait to be able to use this wonderful set. Your videos are so helpful for me to watch as im learning and starting with stamping and cards. I really love this new stamp set. Two weeks ago we had my grand-daughter’s confirmation and I had a difficult time with the card. It was pretty but could have been better with this set. Can’t wait to get the set and framelits. Love these beautiful cards! Thank you for the inspiration! You brighten my day! Wishing you God’s blessings in the New Year. Thank you, Brandy for your wonderful inspiring cards! They all are so beautiful! I love this stamp set and framelits! Congratulations! Brandy, I love this new Stamp set and dies (Hold On To Hope). Thank you for designing such an inspirational set. It was well- needed and will be well-used (once available). These cards are outstanding! I definitely need that stamp set. Would love to win it. Thanks for all you do for us! Beautiful card and stamp set – congratulations and thanks for all you do! Beautiful card and sentiments – thank you for all you do! Brandy, I would like to congratulate you on your stamp set.r What a wonderful opportunity for you to be able to design your own set, with such heart and purpose. Now this is a set that everyone can use! I can see this set used for so many events in life. It surely is a wonderful way to give encouragement to those who are less fortunate than others. I hope the foundation continues to grow to help children everywhere. Your heart and your faith will help make this happen. Your son is blessed to have opened his heart to his friend Parker. Absolutely love this stamp set look forward to ordering the combo! Beautiful card! I love the colors that you have chosen. The sentiments are perfect and are so much needed in this day. It’s so hard to find encouraging stamps for those cards that are so important. Thanks for your hard work in designing this stamp set. I love watching you videos for inspiration. What a beautiful stamp set and dies. Congratulations on a beautiful design. Thank you Brandy for showcasing such a lovely set. My prayers are with Parker and his family as well as with you and your family. Thank you also for all of your energy, effort, and the joy you share with all of your videos and cards. Brandy, many congratulations on your milestone achievement, and this beautiful stamp set. It is lovely, and will be sure to be used and enjoyed by so many of us. Wishing you and your family a very Merry Christmas! Congratulations, I love your stamp set and thinlets! Thanks for the inspiration. Love, love, love ?? this card. Awesome demonstration Brandy! Hi Brandy, Congratulations on Million Dollar sales and being able to design this stunning set. It will be the first one I buy from the new catalog. I LOVE it and the and the fact that it is a bundle, too. Perfect for those of us who don’t fussy cut very well. 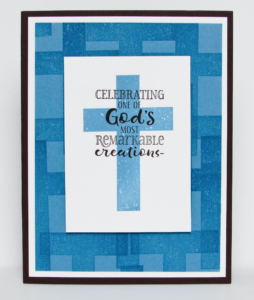 The sentiments and scripture verse are perfect for offering hope and encouragement and there are a myriad of uses for the set. Thank you for your beautiful designs! I look forward to each of your videos to see what you have come up with next! May God continue to use you for His glory in this calling and may you and your family be blessed with a Merry Christmas! I am so excited for you and this stamp set!! It is truly an uplifting and meaningful set…that is for sure!! After all we all need HOPE and encouragement and that is what this set represents!! You are truly an inspiration and I enjoy every video and tutorial…with the hope of learning your techniques!! ? Thanks so much for blessing others!! Brandy, I have been waiting to purchase a “perfect” cross stamp set. When I saw the gorgeous framelits that co-ordinated with your set, I knew this was the one. Thank you for designing such a beautiful set for us to use to make wonderful creations to bring hope, peace and encouragement to others. Loved your examples. Brandy, I was blessed to receive one of these cards as a thank you for an order. I love the stamps and so nice there is a die to go with it. I love all your videos. Wishing you and your family a MERRY CHRISTMAS AND A BLESSED AND HAPPY NEW YEAR. Love,love,love this bundle. Definitely going to buy it, can’t wait to get it. Thanks for all the card ideas, and PDF. Love watching your videos! This stamp set is wonderful and filled with Gods love. Where can I buy it? I love your cards. This is a beautiful stamp and die set that you created. I would be proud to own it. Thank you for this stamp set and die bundle. So glad to see SU having more Christian elements. Great video. Oh Brandy this set is AMAZING!!! I love everything it represents too!!!! Your cards are stunning and anyone who receives them as a gift set would be extremely blessed. I have often wondered what stamp set I would design if I were given the chance. I know it would be related to Hope, LOVE, Mercy and Grace found only through our Lord and the cross. CONGRATULATIONS on your $1 million in sales which you so humbly left out of the video!!!! I also love that there are Framelits for this set. Thanks so much for sharing your God given talent with us and I would be completely ecstatic to win this set!!!! Merry Christmas to you and your family. I have been looking for a set like this, how awesome. Thanks for sharing this, they are beauuuutiful. I love your videos they are very clear and easy to follow. Thank you for your hard work and for taking the time to do these demonstrations. God bless you. I always love watching your videos. All the best to you. Brandy, You have created a beautiful stamp set for an awesome cause! I love stamp sets that can be used for multiple occasions and this bundle will definitely be on my wish list! All three cards are awesome. Thank you for sharing your talent with us! What a surprise this afternoon after receiving your video. I really enjoyed you new stamp set you help create, What an accomplishment to help with the design. Thank you for making stamping easy with your tutorials.. You faith shines through in your work Thanks once again. Brandy…I love your video and I’ve look thru the catalog and have missed this stamp set. What an honor that you were able to design this set. I too have a close family member going through treatments for this terrible disease. I will be ordering this set for sure and again thank you. Have a wonderful holiday! I am just in love with this card and stamp set. Plus the dies make it a huge bonus. Way to go designing this stamp set. Its simply beautiful. I get a lot of inspiration from you and your videos, and now this stamp set! I currently have a friend battling pancreatic cancer, and this set would make a lovely card for her. I especially like the vine winding around the cross. Cancer is such a bullie. Parker is lucky boy to have you as his matador. I love this set and what it stands for. I can hardly wait to use it! AND as always love the card, Brandy! I love watching your videos. So exciting that you got to design this stamp set. Such lovely cards you have created with this set. It is a lovely gift your are giving. Thanks so much for sharing your beautiful smile on the video. You made that seem so easy. Thanks for the card measurements. That I can do. lol Have a great week. Thank you for creating this beautiful stamp set! Brandy, Thanks so much for designing the beautiful Hold On To Hope set. It’s hard to find great Christian inspirational sets. I definitely need(not just want) this one. When will it be available for ordering? Brandy – Your new stamp set is beautiful and will be perfect. We have a woman at church who sends cards to parishioners who are ill, who lost a loved one, for their birthday, and who may be going through hard times. She doesn’t have a lot of money, so I make her cards to send and she is so appreciative. I plan on purchasing your set for that purpose! Thank you for designing such a set and thanks to Stampin’ Up for choosing to put it in their catalog. Congratulations Brandy!!! That is awesome! I LOVE the stamp set and cannot wait to get my hands on the bundle! I love message of hope that it includes and that fact that you showed your appreciation to your team! That is so great! You are a beautiful person, inside and out. Thank you for sharing your ideas with all of us! I loved the card of hope you shared. Thank you. IF GOD could close the mouths of the lions for Daniel, part the Red Sea for Moses, make the sun stand still for Joshua, open the prison for Peter, put a baby in the arms of Sarah, and raise Lazarus from the dead, THEN He can certainly take care of you! NOTHING you are facing today is too hard for Him to handle. I definitely could use this bundle as I provide cards for our Pastor and church as a ministry for members and non members as well as those visiting our church or other events in our small community here in Bloomfield, Missouri. Our shut ins and rehabilitating patients in hospital and nursing facilities. Each email tutorials and Brandi have touch many through this home. Thanks. Beautiful cards. I love with the stamp set, but was on the fence about purchasing it – now I’m convinced it’s one I have to have. Thanks for the inspiration. 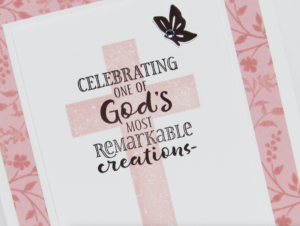 Thanks for the clean and classy cross card idea. You inspired me to make this card for Father Jack and Sister Pat . Always looking for new ideas every year to give them after Christmas mass. I have a cross embossing folder and think I can make it work for this idea. Thank you for designing this amazing and versatile stamp set with dies…..I am always so inspired by your creativity. I absolutely love this new stamp set you designed. I will definitely purchase this when it comes out next year. I’m a Sunday school teacher and this is just perfect to send to my students for birthdays or if they have missed a few Sundays. Thank you for your design. I LOVE this stamp set! I can’t wait for the new catalog! The blue cross card is beautiful and the reason for designing the stamps was wonderful. God bless you. Love, love, love this new stamp set you designed!! Thank you for the video. I love this new cross set! You make such beautiful cards! I am excited to get the new book coming out for 2018! Love this card. You sent me a pink one and I sent it to a granddaughter that is going through a rough time. Thank you!! 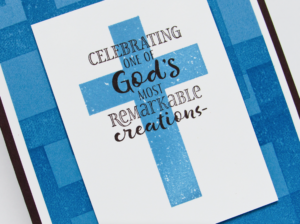 I really love your inspirational stamp and die set and these cards that you have made it really blesses my heart to see religious cards made so many do not do this anymore! God bless you Brandy!!! I love this new cross set! You make such beautiful cards! Keep up the great work! What a lovely card Brandy! I can’t wait to add this stamp set to my collection and start sending out the powerful message of hope. You have truley captured that message in this set. Thanks for being an wonderful inspiration! Love this set for the cards I make for our church. Beautiful cards! Congratulations on your stamp set, it’s beautiful. 🙂 I hope you are having a very blest Advent. Beautiful cards! I would love to win that set.